PITTSBURGH—Carnegie Mellon University's Timothy Verstynen has received a Faculty Early Career Development (CAREER) Award from the National Science Foundation (NSF) for his project "Action Binding During Long-term Sequential Skill Learning: Computational and Neural Mechanisms." Verstynen, assistant professor of psychology and a member of the Center for the Neural Basis of Cognition (CNBC) in the Dietrich College of Humanities and Social Sciences, will use the five-year, $507,836 award to study how the brain learns complex sequential skills, similar to learning to play a melody on the piano. He will do this by using a combination of computational modeling, behavioral analysis and neuroimaging to look at how the sequences of concepts — such as reading notes on a sheet of music — are learned differently than sequences of actions — such as hand movements on the keys. He will then look at how those types of learning are represented in the brain. Verstynen's findings will be used to optimize training programs for skilled learning across many domains, including educational environments and clinical rehabilitation centers. The CAREER Award is the NSF's most prestigious award designed to support junior faculty who exemplify the role of teacher-scholars through their outstanding research, excellent teaching and the integration of education and research within the context of their organization's missions. "Tim is an exceptional young researcher who brings excitement and rigor to the way he investigates the underlying mechanisms of how the brain works," said Michael J. Tarr, head of the Department of Psychology. "I'm very pleased that the NSF has chosen to recognize him with this prominent award and am confident that it will allow him to make important discoveries that will greatly impact our understanding of the brain." Verstynen joined the CMU faculty in 2012. His research focuses on how the brain's pathways regulate planning actions and how that planning changes with experience. CNBC Co-director Marlene Behrmann said that Verstynen is an outstanding researcher who is already having an influence on the university's strong brain and behavior work. "We have a long history of excelling in cognitive neuroscience and computational systems, and it's really thrilling to have young, accomplished faculty like Tim join us and propel us forward as we continue to learn more about the brain. His research is highly innovative, and he is on the cutting-edge of technology being used to study brain function," Behrmann said. For more than 50 years, Carnegie Mellon researchers have been working to achieve historic breakthroughs in psychology and computational neuroscience to tackle multifaceted problems of human thought, such as how we solve problems, learn mathematics or make financial decisions, and how these thought processes can be improved. CMU research on brain-behavior relations also includes a major effort in using brain imaging to understand and treat disorders like autism and dyslexia. To build on its foundation of research excellence in psychology, neuroscience and computational science, CMU launched a Brain and Behavior Initiative to enhance the university's ability to innovate in both the laboratory and in the world. For more information on Verstynen, visit http://www.psy.cmu.edu/people/verstynen.html. 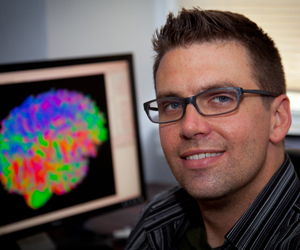 Tim Verstynen (pictured above), assistant professor of psychology and a member of the Center for the Neural Basis of Cognition, will use the five-year, $507,836 award to study how the brain learns complex sequential skills, similar to learning to play a melody on the piano.